Conversations about ethics are often difficult and awkward. Nevertheless, designers can play a vital role in finding new ways for people to relate to and communicate with each other. In this article, Ciara and Samantha set out to understand how ethics is used in contemporary design. The influence of design is expanding beyond the realms of typography and objects and into healthcare, public policy, education, financial services, and more. Designers working in these emerging design fields are responsible for projects that have significant and fundamental impact on the quality of people's lives with clear ethical implications. In healthcare, for example, designers are responsible for creating everything from the industrial designer's medical device that keeps a heart beating to the service designer's physical layout of an operating room. Clinicians, with similar levels of influence, initiate their professional practice by swearing to follow the Hippocratic Oath. This sets specific boundaries that guide the ethics of their behavior. Designers, on the other hand, are given no guidance for ethical decision-making even as they continue to expand their influence into newer and riskier fields with long-standing moral implications. Are designers talking about ethics in their practices? Do designers need or want ethical guidelines? Who should be involved in creating ethical guidelines for a design practice or project? Is there one code of ethics for all types of design and designers? This article explores multiple interactive methods to create ethical guidelines with interdisciplinary teams using design. Small design groups have been exploring ethics in design through manifestos like First Things First in 1964 where Ken Garland focused on the responsibilities of designers working in advertising. In 2007, Valerie Casey's Designer's Accord project brought designers, educators, and business leaders together to define guidelines around environmental sustainability in design. Later, in 2009, David Berman wrote the Do Good Pledge to encourage graphic designers to pledge ten percent of their professional time to "doing good" while simultaneously adhering to moral codes in their work. Unlike these existing manifestos, pledges and projects, we were interested in how designers might collaboratively create ethical guidelines for specific project engagements and teams. By nature, design is collaborative, so we needed to begin to think about how ethics could be created through collaboration rather than individual reflection. With this rich history in mind, we set out to understand how designers thought about and used ethics in contemporary design. We spent a year asking interaction designers, service designers, game designers, graphic designers, industrial designers, and designers in the healthcare space if they were talking about ethics in their practices, trying to understand if designers felt the need for ethical guidelines and if so, how we could help designers develop them. 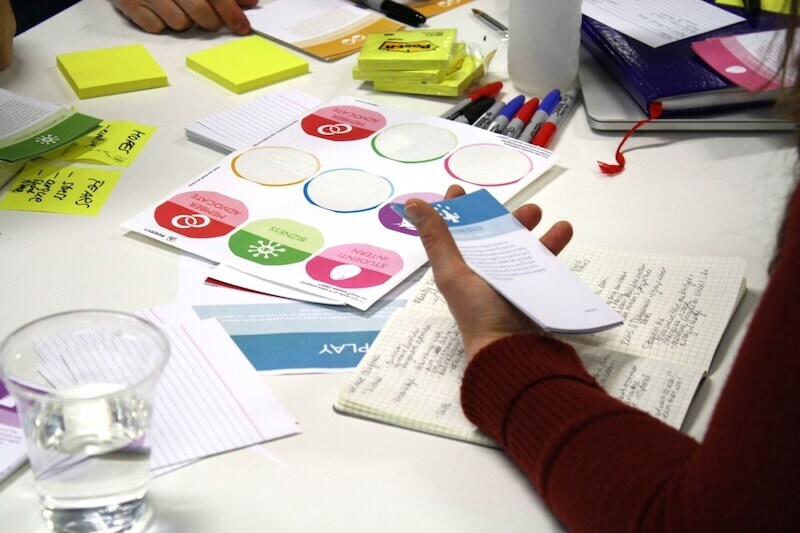 We connected and engaged with 50 designers through an effort with the Service Design Network publication, BarnRaise (a design hackathon event in Chicago), and an IxDA conference workshop. We would be able to create a replicable process to guide people in the creation of these ethical codes. First stage: "Shifting Ethical Responsibilities From Individuals To Communities"
Second stage: "Creating Project-Specific Ethics"
Third stage: "Breaking Down Barriers Through Conversation"
As the year progressed, we learned that not all of these hypotheses were correct. We began our work by collaborating with Mad*Pow and the Service Design Network by inviting 15 designers from across the nation to each remotely rewrite one piece of the Modern Hippocratic Oath, the ethical guideline for medical doctors, to make it applicable to design. We selected designers from different backgrounds (game design, graphic design, healthcare, and industrial design) to see if the essence of ethical responsibility was different across design disciplines. Each designer received a fill-in-the-blank template to express their individual ethical guidelines. 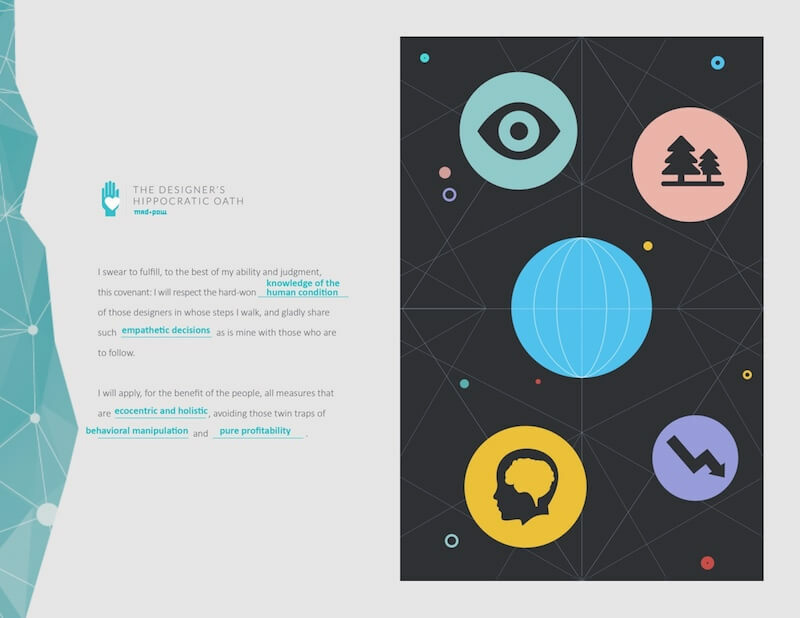 We stitched these 15 templates together to create three Designer's Oaths. Each designer had been assigned one of five sections of the MHO to rewrite, so we placed the pieces back in the order of the original MHO. We had invited 15 designers to take part, so we were able to form three distinct Oaths. This process allowed us to showcase individual design voices as well as highlight their collective representation of a broader community. We formalized these templates and published them online to make the Designer's Oath an open-sourced tool that anyone can use to document their individual or communal ethical guidelines. It is important to stress the remote work that was done at this stage. None of these designers ever met face-to-face or had the opportunity to influence each other's Oaths. We would learn the importance of in-person collaboration when we began to work with specific project groups. By nature, design is collaborative, so we needed to begin to think about how ethics could be created through collaboration rather than individual reflection. The SDN experience helped us realize that we were asking the wrong questions about ethics in design. Ethics are not something one person decides for everyone in a community. In fact, different groups might require different types of ethics specific to their situation. How could we create a tool that teams could use to define the ethical guidelines of their collaboration? Moving forward with this idea, we experimented with more open-ended tools and conversation prompts. We wanted to give teams of people coming from different backgrounds the flexibility to create their ethical guidelines without a template. We were able to explore this concept at BarnRaise, an interactive conference/hackathon for social impact design. We led a multidisciplinary team through the entire design process from research to prototyping in one weekend. We kicked off the experience by facilitating and documenting a conversation with our team to define their ethical guidelines as a collective. The conversation focused on how the team would work together and which responsibilities they collectively had for the people they were designing for. We began by sharing the Hippocratic Oath to spark our team thinking about what a code of ethics might look like. The conversation followed about the community that we would be working with and how we, a design team, should understand our relationship with them. We then focused on answering questions like, "What approach do we want to adapt to address this problem? What is the spirit with which we want to address this problem? What role does the community play in understanding and addressing the problem?" Through these conversations we crafted an oath that outlined their ethical guidelines as a team specific to their project work over the next few days (see below). This document framed the space they were working in, the methodologies they would use, and the mindset they needed to accomplish this task. 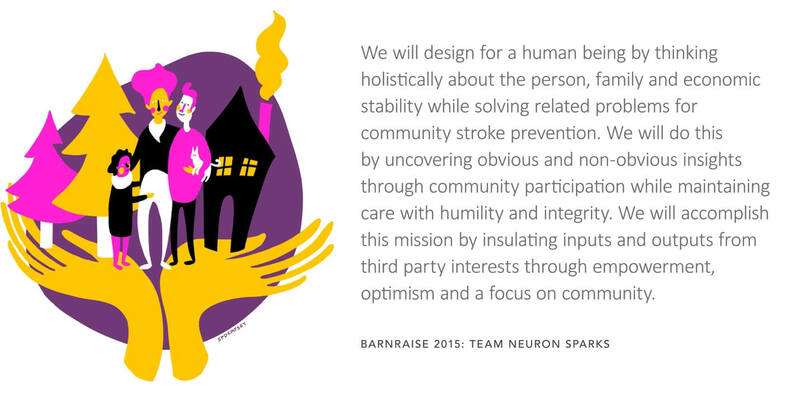 The team, called “Team Neuron Sparks”, referenced their oath throughout the design process. They had been tasked with answering the question, “How might we support stroke prevention by empowering community leaders to educate community members on the South side of Chicago?” The team’s oath heavily influenced their design process, guiding the manner in which they conducted interviews with community leaders and leading them to perform a participatory design exercise. The oath also kept the team focused on understanding the community members holistically in the context of their lives. It helped them maintain their commitment to conducting interviews with humility and with respect for the dignity of the community. 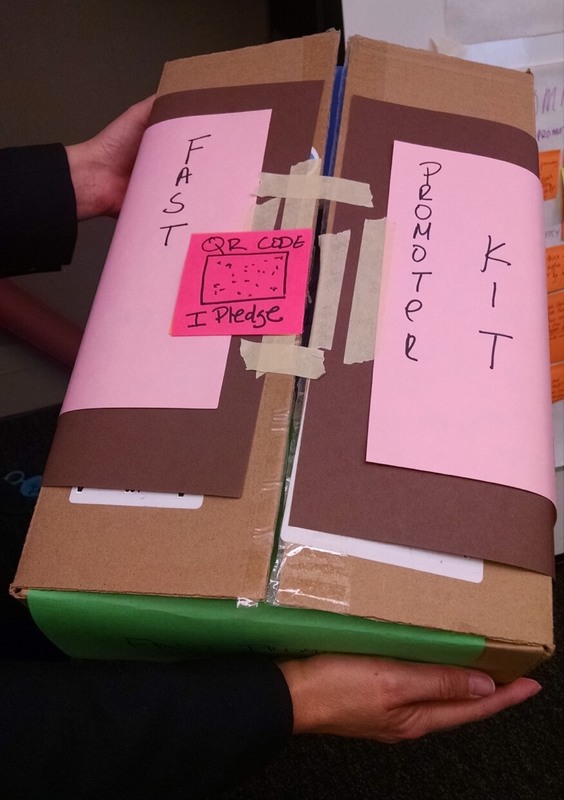 In the end, they created a prototype of an orientation kit for community leaders considering spearheading stroke prevention and a digital app that allowed them to coordinate their efforts. These prototypes have been adopted by the team’s clinician lead who is continuing to iterate on them with support from IIT + ID, the graduate school of design at Illinois Institute of Technology. Ethics are not something that you decide on once and never revisit. Working with “Team Neuron Sparks” helped us realize how important it was to continue to talk about ethics throughout a project, not just at the beginning. Ethics are alive and must be iterative as our knowledge and position about a project grows and changes. With this in mind, we decided to focus the next effort of our journey on facilitating conversations around ethics. Conversation facilitation led us in an unexpected direction: game design. Our final ethical inquisition led us to create a role-playing game, Ethics Quest, which we play-tested at IxD16, in Helsinki. Ethics Quest encourages members of a multidisciplinary project team to role play through several ethical situations, each taking on a new role in the process. This empathy-building exercise removes the self from ethical conversations, lowering the barrier to entry and making participants more comfortable talking about difficult subjects. The game gives players the opportunity to take on a role in a project team that they do not play in real life. We provide backstory, skills, and experience to help players get into character and understand how their role might perceive a situation. Players go through 3 different situations: solo, head to head, and cooperative so the player can ease into their character before taking on ethical situations (or “combat”) against another team member. 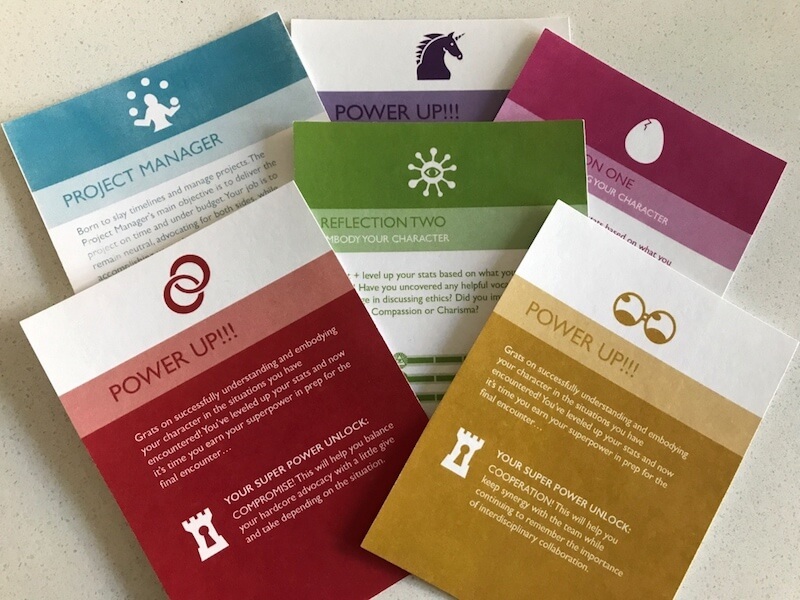 With Ethics Quest, we discovered that conversations between team members were the most powerful tool for changing the way people thought about ethics. Conversations about ethics are often difficult and awkward, but by framing these conversations within the "safe space" of a game, we were able to make things easy and even enjoyable. Ethics Quest also helped people empathize with the goals and perspectives of others which is an essential ingredient for a productive conversation. These realizations helped us shift our focus from creating tools that document ethical guidelines to focusing on the importance of ethical conversations. With this in mind, we are continuing to iterate on Ethics Quest, exploring new ways to incorporate it with project teams and design education. At the end of our year of asking questions, we realized that our initial assumptions about ethics in contemporary design had not been correct. General ethics for design cannot be created by a single entity. Ethics are dynamic, a living breathing thing, unique to each team. Ethics require care and attention from every member of a team to stay alive and relevant. The only way that each team member can feel the personal ownership necessary to maintain a collective code is by taking part in thoughtful, reflective, and co-creative conversations designed to create and regularly breathe life into the team's ethical guidelines. Ethics are alive and must be iterative as our knowledge and position about a project grows and changes. This evolution in our understanding of ethics changed how we understood our role as designers. We shifted from seeing ourselves as creators of static ethical documentation to being the facilitators of conversations that would change the practice of design ethics. If we hope to change the function of ethics in our profession, then we must first change how we view our role in that process. We must become designers of conversations and find new ways for people to relate to and communicate with each other. This shift is necessary not only to change the view of ethics within our profession but also to position designers to be catalysts for ethical change within our larger organizations. As designers, we have the opportunity to design conversations about ethics with every team we are a part of, influencing the perception of ethics in any organization wielding the power of design. Through these conversations, design can become a powerful tool for doing good. Take action by facilitating these conversations and empowering your teams to design ethically. Start small and think about your own ethical guidelines first. Consider any duties you believe you have as a designer. What or who do you stand for in your design work? Write, draw, or find some other way you feel comfortable expressing and documenting your ethical guidelines. Engage with your project team and invite them to think about their individual ethical guidelines. Ask each individual team member to express and document their ethical guidelines. Consider how you might make this easier for people by co-opting an existing guideline by turning it into a fill-in-the-blank outline, prompting alternative ways of thinking by asking people to express themselves visually instead of verbally, or creating a safe space to talk about ethics by using gameful design. Share and discuss with each other to understand and empathize with each team member's ethical beliefs. Facilitate a team discussion about how you might combine your individual ethical documents into one collective statement that is specific to your team's problem space or current engagement. Consider answering the following questions: what roles are represented by the group assembled? What roles are missing? Who are you designing for? What are the specific concerns and ethical ramifications of the problem space? How do you ensure ethical alignment and integrity of the project throughout the engagement? How might you invite "end users" to collaborate on these guidelines? How does your statement interact with other relevant professional codes? Document your discussion by collectively crafting an ethical statement to guide your team's decisions throughout your engagement.